At the dawn of the twenty-first century, the legitimacy of American capitalism seems unchallenged. The link between open markets, economic growth, and democratic success has become common wisdom, not only among policy makers but for many intellectuals as well. In this instance, however, the past has hardly been prologue to contemporary confidence in the free market. American Capitalism presents thirteen thought-provoking essays that explain how a variety of individuals, many prominent intellectuals but others partisans in the combative world of business and policy, engaged with anxieties about the seismic economic changes in postwar America and, in the process, reconfigured the early twentieth-century ideology that put critique of economic power and privilege at its center. The essays consider a broad spectrum of figures-from C. L. R. James and John Kenneth Galbraith to Peter Drucker and Ayn Rand-and topics ranging from theories of Cold War "convergence" to the rise of the philanthropic Right. They examine how the shift away from political economy at midcentury paved the way for the 1960s and the "culture wars" that followed. Contributors interrogate what was lost and gained when intellectuals moved their focus from political economy to cultural criticism. 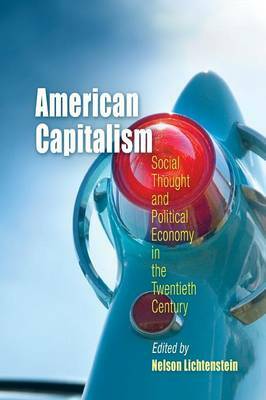 The volume thereby offers a blueprint for a dramatic reevaluation of how we should think about the trajectory of American intellectual history in twentieth-century United States.